In the layman's terms Internship is a job before the actual job, a peep into the career of once choice before it actually starts. One gets live experiences of going to office or may be work-from-home , get real responsibilities, learn new skills and utilize the existing skills. The best part is that you doe receive a pay checque. The best way is to try hands on experience in what you like to join so that you may know in advance as What to expect. We provide students with this opportunity of working with companies not as an employee but as Interns, which mean they will be able to understand what is the expectation of employer from them in advance and how can they grow in an organiation or in particular role. This will also let them start earning income in the form of Stipend which is a great sense of ahcivement at time for students and for sure a great motivation too. How does an internship help? Help one peep into the job of their dreams before actually taking it. Opens many doors in the form of references by the Mentor or people with whom one gets in touch with. Help earn you money and good credit too. When to take up an internship? An internship can be taken up as and when the opportunity knocks the door. One should plan to utilize time in exploring good companies or work profile for self to work as an intern. Many Companies hire interns round the year, but most students do internships during summers and winter breaks because they have no exams pressure during this time and lesser curriculum engagements. There are many students who even do internships round the year; work-from-home internships can be a real awesome experience and this culture is getting into India as well! We help students in getting short term internship which ranges from 2 weeks to 8 weeks. During this they can work on some short term project to earn money or experience or both. Students can work on some short term projects or Job to identify their interest area in particular field or to improve their skills. Definitely such certificate or a line in your CV will make you stand out of crowd. Industrial Training will not only benefit you in order to know what you should know about a job before hand but also allow you to discover your area of interest. Courses like CA/CS or B.Tech or M.Tech have requirement of Industrial trainings. 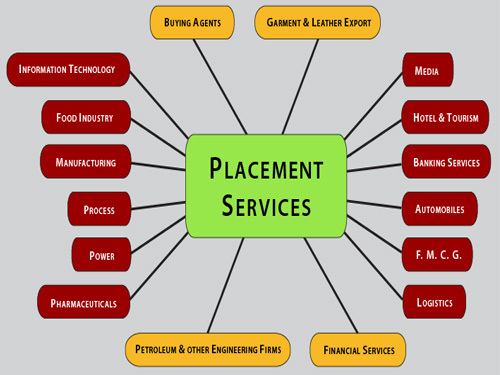 As per most of the Government courses the Placement is part and parcel of course curriculum and placement is as much necessary as training is. Thus our dedicated Placement cell is working Day and Night to add more and more prospective employers who can recruit our students for Job in their organisation. The best way is to try hands on experience in what you like to join so that you may know in advance as What to expect. We provide students with this opportunity of working with companies not as an employee but as Interns, which mean they will be able to understand what is the expectation of employer from them in advance and how can they grow in an organization or in particular role. This will also let them start earning income in the form of Stipend which is a great sense of achievement at time for students and for sure a great motivation too. We provide Manpower Services to all Industries, MNCs, Limited / Private Limited Companies, Firms etc. for their IT & Non-IT Functions. We provide several human resource solutions to our clients & candidates catering to the entire employment and business process. This is the ultimate aim of our training i.e. to get our candidates placed at the best possible opportunity. We do have a dedicated team of Experts Recruiters, who work on our client's requirement and give them best suitable prospective Employees list. We have a vast database & a huge network references in industry to provide large number of opportunities to our candidates & clients. We offer flexibilities to both the Job Seekers and the Companies. Job Seekers can choose when, where and how they want to work and the Companies can get the skills what they need during their busy time. We also provide Customised Trainings to candidates as per our client's requirement so that the resource can be productive from the day One.